The changing consumer demands and continuous technological advancements put across a whole new set of opportunities and challenges for the ecommerce businesses, making it of prime importance for an ecommerce site to always be prepared to change, upgrade, or even revamp (if required), in order to experience continued success and to meet consumer expectations. It is very important for online retailers to pay attention to the latest trends in the consumer behavior and the sector, and adjust accordingly. This is best done by implementing tools that integrate effortlessly with your existing ecommerce framework and help you increase conversions and sales. 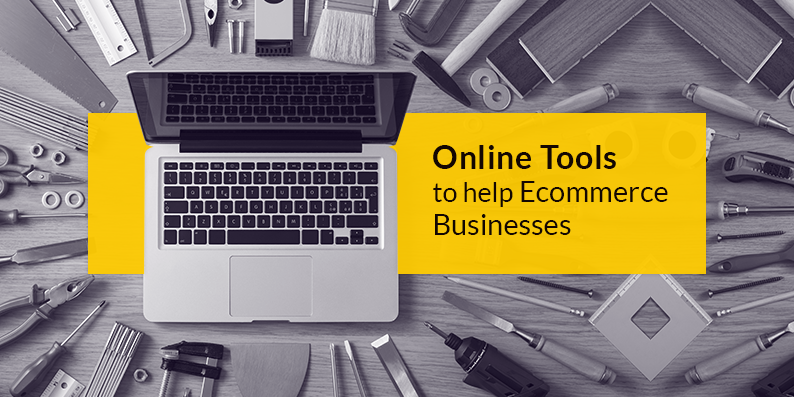 Thankfully, there’s no shortage of online tools that help ecommerce businesses streamline and simplify their day-to-day tasks. a. Google Analytics: A highly effective tool by Google that helps you view who is coming to your website from which sources. An integration of this Analytics tool on your ecommerce platform can really help you do wonders. A small integration is all you need to be ready to use it. What is the demographic that you should be catering to? And so on, are some of the analytics that it offers. b. Kissmetrics: A wonderful tool designed by some of the world’s greatest modern marketers, Kissmetrics is built to optimize your marketing efforts. It delivers key insights and timely interactions to turn visitors into customers. This is done by doing an in-depth analysis of your website visitors, helping in targeting and re targeting customers, along with a host of other methods. a. Social Mention: Use it to understand the sentiment of social media buzz around your ecommerce business, and monitor multiple websites at one place, or find out which keywords people use. The statistics include sentiments, top keywords, top users, top hashtags, last mention and more. b. Brand Yourself: This ORM tool is used to control what people find when they Google your name, and offers a range of services from free do-it-yourself product, to managed services for both, individuals and businesses. c. Naymz: This is a tool that helps you track and manage your social influence, and also offers a program called RepScore, that rates your online influence across different social networks in a relative comparison to other members. a. Buffer: With this tool you can schedule posts and interact with your audience across different social media accounts while tracking the performance and getting valuable analytics of the social media campaigns. b. IFTTT (If This Then That): A free web-based tool, IFTTT connects to all the apps or accounts that you use and with the help of simple conditional statements, called “applets”, it triggers upon changes made to other web services such as Gmail, Facebook, Instagram, and Pinterest. For instance: If: user tweets using “X” hashtag, then: email message. c. Hootsuite: It helps you manage all social accounts at one place while scheduling all of your posts for the future. a. Canva: A highly remarkable platform, Canva helps you quickly edit and put together professional images for your blog, website and social media accounts, without having to hire a graphic designer. b. Pixlr Editor: This is a web-based, lightweight and easily accessible tool, which provides free creation, editing, cropping, and design tools for digital photos and imagery, at par with professional design software. c. YouTube Video Editor: This is a video editing tool that offers a host of features such as combining of multiple clips, trimming a clip, customization of a clip with special effects, addition of sounds and publishing the same on the YouTube channel. a. Google Webmasters: Similar to Google Analytics, Webmaster is a tool developed to help Google index your site, and sees what problems are floating around your online store. It is also used to check if you have any broken links, and to view commonly searched keywords and more. Not sure how to scale up your ecommerce business? a. SEMrush: This tool helps you conduct competitive research covering aspects such as: Keyword Research, Competitor Research, Site Audit, Back link Analysis, etc., on any domain name and to use the data to optimize your campaigns. SEMrush shows you the search engine results pages (SERPs) and keywords and it’s updated in real time, which can be used to create content that can interest readers. b. SimilarWeb: SimilarWeb is primarily a competitive analysis tool that helps you in digging into a site, app or platform, and provides one of the most accurate insight about any given site. a. MailChimp: With the help of MailChimp, you can design striking emails that prompt customers to come back and buy more products, and drastically improve your customer retention. b. PutsMail: Litmus PutsMail lets you enter your HTML, subject line and desired recipient addresses (up to 10) to see a fully functional preview of your campaigns, and lets you see what exactly your email will look like in the inbox. a. Google Keyword Planner: Google Keyword Planner lets you enter keywords you aim to target and get insights of what people are actually searching (Filter based on location, demographics and more), to help you further with your SEO. Using this tool, you can achieve related keywords that you can use on your blogs and product pages. b. URI Valet: This tool helps you get access to a host of information including: the total number of objects (http requests), time to download, object details, document internal links, and external links along with verifying server headers for each. a. Trello: Trello that has recently emerged as the go-to option; is a clean and interactive system that will help you and your staff understand the tasks that you have on your plate and how it needs to be completed. You can even integrate with other apps to track and perform other tasks. b. Freshdesk: The other option here is – Freshdesk. It is a cloud based project management system that comes with everything you need to track and manage projects, with some of its features being: issue tracking, SLA management, smart automations, SEO ready FAQ section, Knowledge base and customizable Self Service Portals, which helps in maximizing the productivity in ecommerce and reduce burnout. Not satisfied with your ecommerce website? Migrate to YoKart today! Keep visiting us more such information.